In my experience, there is almost nothing about fabrication that goes completely right the first time. So, I have no idea why I spent so much time calculating the chassis mount locations for my custom leaf spring conversion that I'm doing on the Daihatsu Fourtrak (F73). With hopes of it paying off, I did in fact, spend a lot of time calculating where each of the mounts went. I was hoping to get the axle centered on in the fender well the first time. There where, though, a few factors that were working against me, and at least one, that I was just refusing to accept. All of that put together, added up to some wasted time. My advice... Don't ignor what's obvious, and don't try and convience yourself you can make it work, when... It's so obvious that it's not going to work. Here's a fact for you... There are people in the world that have better spacial perception than others. I, I am not bad when it comes to spacial perception. In fact, a lot of people tell me that, while driving, I have really good spacial perception. However, I know my limits. Even if I do choose to ignore them from time to time. That my friends, is exactly what I did while trying to install my leaf spring mounts. Let's start with the most obvious and move forward from there. To start with, I was about 93% sure that by leaving the rear tow hooks on the Daihatsu chassis, the shackle/leaf spring shackle eyelet would come in contact with it. Still, being lazy and... "Just wanting to get it done", I oppted for the, "leave it in", option. All this did is cause me double work. I should have just cut them off to begin with. Leason learned. That is, until the next time I get lazy. Another thing I should have done from the beginning is just put the wheels and tires on the axle to center everthing up better. Why would that have helped? It would have helped because while disc or drums can be used to center your axle in the fender well, the more you fill the fender well up, the easier it is for your eye to tell how centered, or off, you really are. My first attempt at centering the axle up is a perfect example of that. I nudged that axle a little forward, then a little back, just to nudge it forward again I don't know how many times. If I had just put the tires on, I would have been able to see how off my centering was the first. Realizing my need to shift my brackets, and also realizing my need to cut off the tow hooks for sure. Life would have been considerably easier. Next time I go to put another custom leaf spring suspension on a rig, I will do the following things. 1) I will be realistic about how much a SOA will lift my rig. Making sure my front suspention can equate the rear. 2) Put my leaf spring pack on the axles, put bushings in eyelets, center the axle up in the fender wells (with tires on), and mark center of the bushing holes. 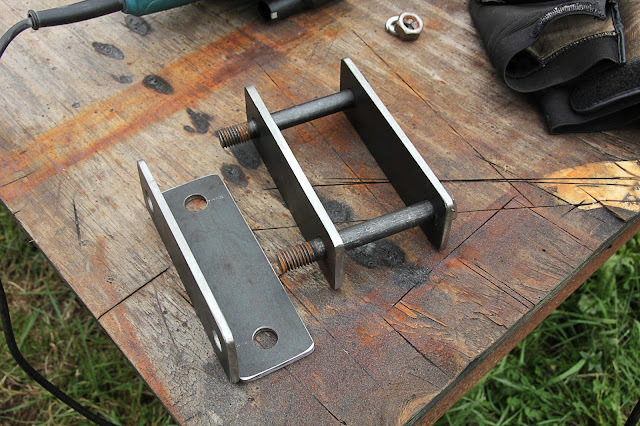 3) Tack weld on tabs and brackets based on where the previous marks had been made knowing that the axle had been correctly centered. 4) Cut off any obviously obstructive objects before installing suspention components. 7) Start from complete scratch. Cut all suspension components off of the chassis and the axle in the beginning. Not trying to reuse old oem suspension components and make my suspension work around the old. 8) Pre buy all my suspension components before I start piecing the suspension together. Honestly, I'm sure that there are other things that I can add to this list, but I'm just forgetting them right now. These though, are some of my more important ones that I know of. So, when you read this article, watch the episode above, and look at my photos, don't forget to take in to account what I've mentioned. While I'm not the expert, I have spent the time and cash figuring out a lot of the, don't do's, so you don't have to suffer them. As always, plan, measure, measure again, don't be lazy, cut once, tack weld first, cycle suspension or components, then final weld, paint, finish. If you and I can get this down, fabrication will be even more fun, and we will truly be able to enjoy our craft and hobby. Don't get me wrong, it'll never work out that we get it all right the first time. We can try though, to rework the least amount of components possible. Just remember, have fun and be safe fabricating. Don't let money overtake ingenuity, and don't let economics take over security. Always think, work, and fabricate safely!